Kuala Lumpur, 10 February 2011 – AETN All Asia Networks which owns and operates the channel HISTORY™ in Malaysia, once again in collaboration with FINAS, The National Film Development Corporation Malaysia, tells the story of the legendary talent of Sudirman Arshad who, at the peak of his career, took the Malaysian entertainment industry by storm during the late 1980s. The one-hour biography, Sudirman Arshad, documents the life of one of Malaysia’s most brilliant entertainers from childhood through his illustrious singing career which was tragically cut short by his untimely death in 1992 at the age of 37. Multi-talented Sudirman was a lawyer, television host, writer, cartoonist, actor, and entrepreneur. But he is most remembered for his dazzling stage performances and his innate musical talent. As the first Asian artist ever to record an English single at the illustrious Abbey Road Studios, UK, Sudirman went on to win Best Performer at the first Asian Music Awards held in London in 1989. However, behind all the glitz and glamour lay the emotional and psychological struggle that was Sudirman’s personal life. He never really recovered from two severe blows – losing his mother at such a young age, and the failure of his marriage to his childhood sweetheart. As a result, the singer constantly battled with emotional emptiness. Even his illness and death were shrouded in controversy. Through poignant interviews with friends, and personalities from the Malaysian recording industry, such as Yang Berbahagia Datin Rudiah Arshad, Bahyah Mahmod, Beh Suat Pheng and Dani’el Dharanee Kannan, the documentary looks at the real story behind the Malaysian icon with an unstoppable drive for perfection. 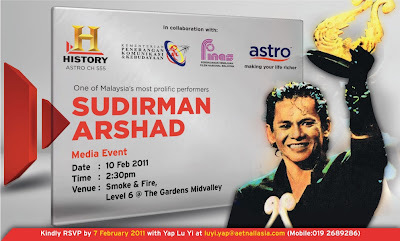 “Sudirman is a true Malaysian icon whose legendary talents are loved throughout the region. Despite his personal struggles, he managed to achieve stardom in the short span of his career. Many people will be able to identify with his life story, thereby making his achievements all the more admirable. We are very pleased to have been able to collaborate with FINAS, and their support has helped us do justice in the retelling of this legend’s story,” said Louis Boswell, General Manager of AETN All Asia Networks. “FINAS is very proud to be a part of this inspiring production. 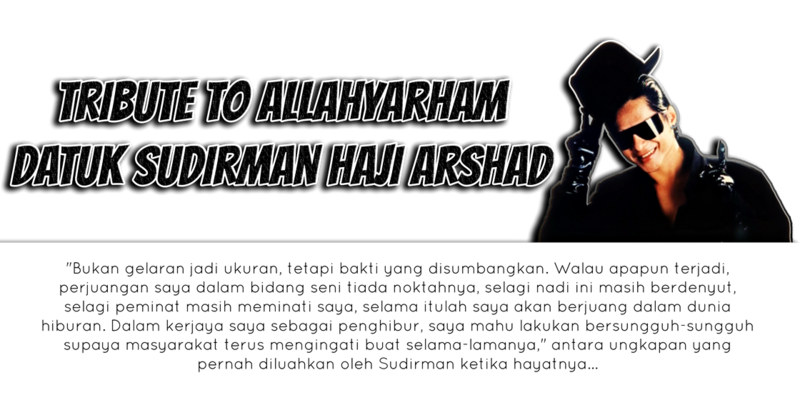 Sudirman was a professional artist who lived, worked and ultimately died for his craft, his country and his fans. He changed the Malaysian entertainment industry with his quirky fashion sense and charismatic on-stage performance never before seen in Malaysia. This documentary aptly reveals why Sudirman was so well-loved and why his legend will continue to live on,” said Mohd Mahyidin Mustakim, Director General of FINAS. 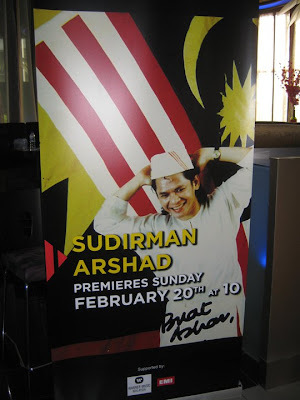 Sudirman Arshad will premiere on HISTORY (Astro Channel 555) on 20 February 2011, at 10.00pm. The programme is subtitled in Bahasa Malaysia and Chinese. • Sudirman achieved more accolades over a wider spectrum of musical genres than any other Malaysian artiste. 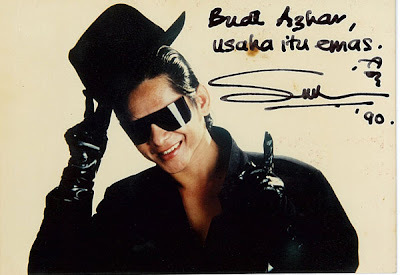 • Sudirman had 20 albums and 70 songs to his name over his 16-year career. • He was popular in Malaysia, Singapore, Brunei and Indonesia. Although he sang principally in Malay, he performed in Hawaii, Melbourne, Tokyo, Dubai, London and even Russia. Not even Malaysian silver screen legend P. Ramlee was as popular in Asia in his time as Sudirman was in his. 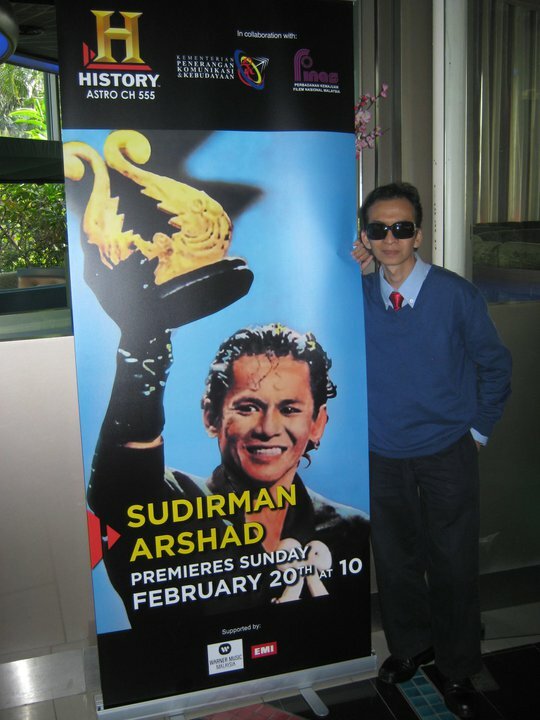 • In 1989, Sudirman was crowned best singer at the inaugural Asian Popular Music Awards at the Royal Albert Hall, beating his more famous contemporaries such as Leslie Cheung (Hong Kong), Anita Sarawak (Singapore) and Kuh Ledesma (Philippines), and others from China, Japan, Taiwan, South Korea and Thailand. • His 1987 song “Merisik Khabar” topped the charts in Malaysia, Indonesia and Brunei and stayed as the #1 song for two months. Another song on the same album also made it to the top of the charts. • He recorded an album with Stock, Altken & Waterman (SAW), one of the most successful British songwriters & producers at the time. • He was referred to by Simon Napier-Bell, the manager of British pop group Wham, as an “institution of the Malaysian music industry”. • His Chow Kit Road concert of 100,000-attendance has never been replicated nor has a similar concert been organized since. • Sudirman’s style and performance traversed cultural and racial boundaries. He sang in Malay, English, Chinese and Tamil; 25 years before the ONE-MALAYSIA concept was conceived. • For all the fame and fortune, Sudirman’s personal life was in shambles. He never really recovered from two severe blows – not knowing his mother at all and the failure of his marriage to his childhood sweetheart. Losing his mother at such an early age made him feel unloved and he constantly needed reassurance all his life. • Till today, the controversy surrounding his illness and his death remains. • Even Sudirman’s mother was an extraordinary person – a politician who fought for Malaya’s independence alongside Tunku Abdul Rahman. She made headlines as the first state assemblywoman in 1955 at the age of 29. • Both Sudirman and his mother are remembered for their contributions to state and country through their memorabilia, exhibited at the Pahang State Heroes Museum.